Our new Wireless HD 1080P HDMI Transmitter and Receiver Kit with IR is designed to support the wireless transmission and control of an HDMI FHD 1080p video signal between a source (console) and a sink (HDTV) when separated by a direct line-of-sight distance of up to 200m. The Wireless HD 1080P HDMI Transmitter and Receiver Kit with IR is the solution when it comes to covering large distances up to 200m, or accessing an isolated site or room. It works through walls, barriers and other obstacles and although the distance will be reduced, operation and viewing results are unaffected, with a latency end-to-end of less then 16ms. 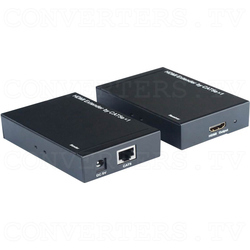 Not only does the Wireless HD 1080P HDMI Transmitter and Receiver Kit with IR extend video and audio signals beyond an HDMI cables limitations, it also allows you to control attached source devices by using in-built IR Blaster and Receiver circuitry. Control the source-end equipment using the source's own remote control, while actually sitting at the receiver-end. Simply point it at the Receiver's attached IR sensor eye. The Wireless HD 1080P HDMI Transmitter and Receiver Kit with IR gives full support for SD and FHD input and output HDMI resolutions, from Standard Def 480p/576p through to Full High Def 1080i/p @ 8 bit Deep Colour and 4:4:4/4:2:2/RGB Colour Space. When used with a PC, the maximum input resolution is 720p. With HDCP compliance and supporting HDMI v1.3 features and specifications, digital audio is presented as a standard LPCM 2CH format. Wireless connectivity of the digital video and audio stream is at 2.4GHz to 802.11b/g/n standards for Wi-Fi. It also supports end-to-end signal transmission over a direct line-of-sight distance of up to 200m away, even further if a Wi-Fi repeater is added. When used in confined areas, the Wi-Fi signal will carry through walls and barriers easily, allowing the User to setup a HDTV in co-located rooms. A feature supported by the Wireless HD 1080P HDMI Transmitter and Receiver Kit with IR are two USB ports at the Receiver end, for the extension of keyboard, mouse or other USB based functions. By cabling the Transmitters mini-USB port to a PC's USB port, the keyboard and mouse can now be connected directly to the remote end Receiver and the HDTV becomes the PC's 720p monitor. Giving greater flexibility and functionality when utilising Wi-Fi systems, the Wireless HD 1080P HDMI Transmitter and Receiver Kit with IR is a reliable, high quality and trouble free Wi-Fi system. 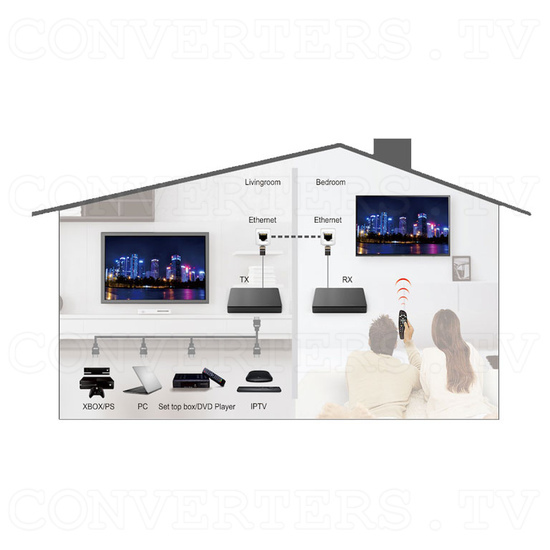 Our new Wireless HD 1080P HDMI Transmitter and Receiver Kit with IR is designed to support the wireless transmission and control of an HDMI FHD 1080p video signal between a source (console) and a sink (HDTV) when separated by a direct line-of-sight distance of up to 200m. The Wireless HD 1080P HDMI Transmitter and Receiver Kit with IR is the solution when it comes to covering large distances up to 200m, or accessing an isolated site or room. It works through walls, barriers and other obstacles and although the distance will be reduced, operation and viewing results are unaffected, with a latency end-to-end of less then 16ms. Not only does the Wireless HD 1080P HDMI Transmitter and Receiver Kit with IR extend video and audio signals beyond an HDMI cables limitations, it also allows you to control attached source devices by using in-built IR Blaster and Receiver circuitry. Control the source-end equipment using the source's own remote control, while actually sitting at the receiver-end. Simply point it at the Receiver's attached IR sensor eye. The Wireless HD 1080P HDMI Transmitter and Receiver Kit with IR gives full support for SD and FHD input and output HDMI resolutions, from Standard Def 480p/576p through to Full High Def 1080i/p @ 8 bit Deep Colour and 4:4:4/4:2:2/RGB Colour Space. When used with a PC, the maximum input resolution is 720p. With HDCP compliance and supporting HDMI v1.3 features and specifications, digital audio is presented as a standard LPCM 2CH format. Wireless connectivity of the digital video and audio stream is at 2.4GHz to 802.11b/g/n standards for Wi-Fi. It also supports end-to-end signal transmission over a direct line-of-sight distance of up to 200m away, even further if a Wi-Fi repeater is added. When used in confined areas, the Wi-Fi signal will carry through walls and barriers easily, allowing the User to setup a HDTV in co-located rooms. A feature supported by the Wireless HD 1080P HDMI Transmitter and Receiver Kit with IR are two USB ports at the Receiver end, for the extension of keyboard, mouse or other USB based functions. By cabling the Transmitters mini-USB port to a PC's USB port, the keyboard and mouse can now be connected directly to the remote end Receiver and the HDTV becomes the PC's 720p monitor. Giving greater flexibility and functionality when utilising Wi-Fi systems, the Wireless HD 1080P HDMI Transmitter and Receiver Kit with IR is a reliable, high quality and trouble free Wi-Fi system.